With the weather getting crisp now that winter’s here, these delightful cable knit blankets will keep your little ones cosy on cold winter mornings when nothing sounds better than cuddles on the couch. 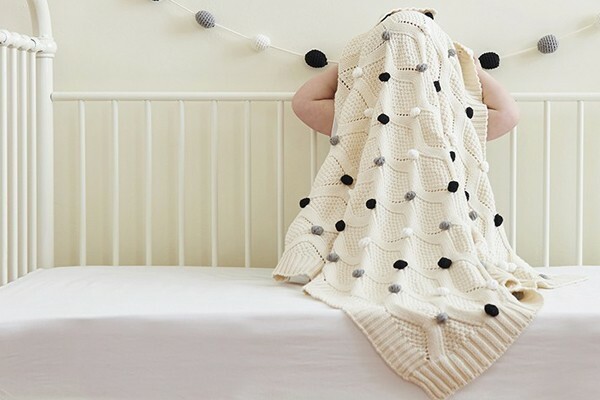 Petite Jolie are an Australian-based online children’s store with a range of unique, stylish and quirky products like this Monochrome Pom Pom Blanket. Not only will it keep your little one warm, the unisex blanket will look great in the nursery or thrown over baby’s knees in the pram while out for a walk. Made from pure cotton in a beige colour with pom poms throughout, the blanket measures 76cm by 100cm. Find it online at Petite Jolie for $70.